Varicose veins are the result of venous insufficiency. There are many things that influence the health of the veins in our legs. Among these are hereditary, obesity, sedate life styles, and of course, age. The population of the United States is getting older, the Baby Boomers are now in their 60’s, and, unfortunately many of us are over-weight (including me). The Heart is responsible for the blood flow in our bodies. The circulatory system is made up of the heart, arteries which carry blood from the heart to our legs and arms, arterioles and capillaries (where oxygen is exchanged), and veins which carry blood back to the heart. The heart is an excellent pump, but it needs assistance in getting blood flow from our legs and back to the heart. This is where the valves in our veins come in. The tiny valves in the veins open and close to allow blood to flow only one-way back to the heart. The problem occurs when the valves get damaged form age or from physical injuries to the leg and do not close properly. When the valves get damaged they cannot close properly and the blood can then back-flow and create pooling. This can cause stasis, edema, and in severe cases blood clots or even lymphedema. Spider veins are created by small dilations in the veins just below the skin. Yes, they are a little unsightly. They don’t seem to cause any problems other than a slightly ache, but they are giving you a warning to wear compression stockings to keep them under control so that varicose veins do not develop. 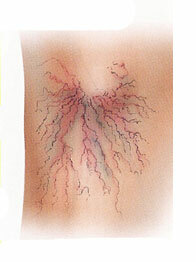 Varicose veins are created by poor circulation in the venous system. They are generally ropy looking and should be evaluated by your physician. If left untreated, they can lead to much more serious problems. With varicose veins the valves in the veins become incompetent and the function of returning blood to the heart has been compromised. This condition is called venous insufficiency and can have very serious consequences. Wearing your support hose can assist in maintaining control of the varicosities so your venous disease does not progress. There are also many physicians who can advise you of various medical treatments including oblation surgery. Stasis Dermatitis is a red looking inflammatory skin disease that is common with people with chronic venous insufficiency. If your leg looks like this, you should definitely have seen your physician about it. Again, wearing compression stockings will help maintain control of this disease, if left untreated it can lead to venous ulceration, or worse. Venous ulcers are wounds that occur when the veins of the leg do not return the blood back to the heart. The blood may leak out of the vein into the tissue. This causes the tissue to break down and an ulcer to form. They are found on the sides of the lower leg above the ankle and below the calf and are slow to heal and often reoccur. As you can tell venous diseases of the leg can become progressively worst. When you are experiencing leg problems always consult with your physician. They can direct you to wearing the correct compression stockings and can assist you in maintaining control of the disease.